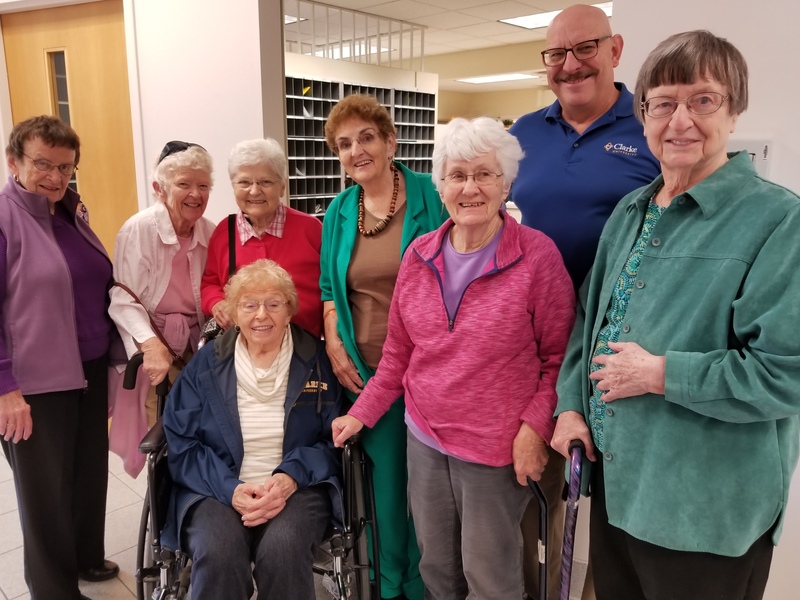 While more than 450 BVMs taught in the 175-year history of Clarke University in Dubuque, Iowa, only four people have served this longstanding BVM mission for more than 60 years. All are Sisters of Charity of the Blessed Virgin Mary. The BVM math here is simple: 4 x 61 = 244 years of combined service! (St.) Kevin Foley, BVM was the first of these servants, who began her service in 1894 (one year after entering the BVM congregation) when Clarke was still Mount St. Joseph Academy. She was among the one third of BVM sisters historically who neither taught nor administrated but worked in support services. Serving in the kitchen, housekeeping, and on the grounds crew, she was especially proud of her landscaping on campus and the lake she helped build there in 1916. She did not retire until 1955. Students who found favor with her could expect a treat of milk and cake set out both mid-morning and mid-afternoon. And she was well known for the dandelion wine she made from the spring campus blossoms! Rachel Eppel, BVM entered the congregation in 1900. 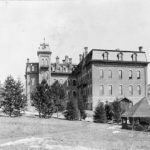 She began her Clarke service in 1907, when the institution was Mount St. Joseph College. While only her second mission, it would end up being the only other one she would have. For 40 years she taught biology and also German, which was the native language of her parents. Her most remembered ministry at Clarke, however, began in 1937 when she was assigned as postmistress. Serving in this role for over 30 years, she was the beloved “Sister Mary Post Office” to generations of Clarke students. As a woman with a sense of humor, she chuckled in recalling the time that someone insisted on mailing a letter airmail from Clarke to Loras College, just a few miles away. She had to inform said person that the college had no helicopter! Upon her retirement in 1968, she was awarded the Pro Ecclesia et Pontificate medal by Pope Paul VI, the highest medal that can be awarded to lay people by the Papacy. And, she could crochet up a storm, even winning a crochet contest at the state level in her late 90s! (St.) Clara Sullivan, BVM, entered the congregation in 1916 and came to Mount St. Joseph College during The Great War in 1918. There she re-established the Home Economics Department, and would teach and chair in that department for over 50 years! She is most famous for her “Kitchen of Tomorrow” with its attendant radio show, which aired for the last 40 years of her teaching career. Over the years, she would publish four cookbooks, be given the McCall’s Award for public service to women, and the Woman’s Year Certificate of Leadership in Dubuque. (St.) Clara was most proud of “her girls,” as she affectionately called her students. Dozens would go on to be teachers, dieticians, hospital and nursing home administrators, and even professors with their doctorates. Although she retired from her professorial duties in 1969, for the next 10 years she worked part-time in the Clarke Alumnae Office. On Clarke Founders’ Day, Ramona (Simone) Barwick, BVM “Sister Mary Bookstore” (sitting) is joined by BVMs Carolyn (Lester) Farrell (l.), Nancy (Josephine Mary) McCarthy, C. Jean Hayen, Elizabeth (Paul Thomas) Olsen, Carol (Conrad Ann) Cook, Associate Norm Freund, and BVM Mary A. (Michael Edward) Healey in front of the newly dedicated Barwick Eppel Mail Center at Clarke University. The name was changed to honor the two long-time BVM employees who work(ed) there. Ramona (Simone) Barwick, BVM entered the BVM congregation from Milwaukee in 1949. While a teacher in her earliest years of service, in August of 1957 she received a change letter sending her to Clarke. And here she would remain! Like BVM (St.) Kevin Foley before her, the entirety of Ramona’s Clarke service would be outside the domain of teaching. Her duties for the first 10 years mainly involved the kitchen. 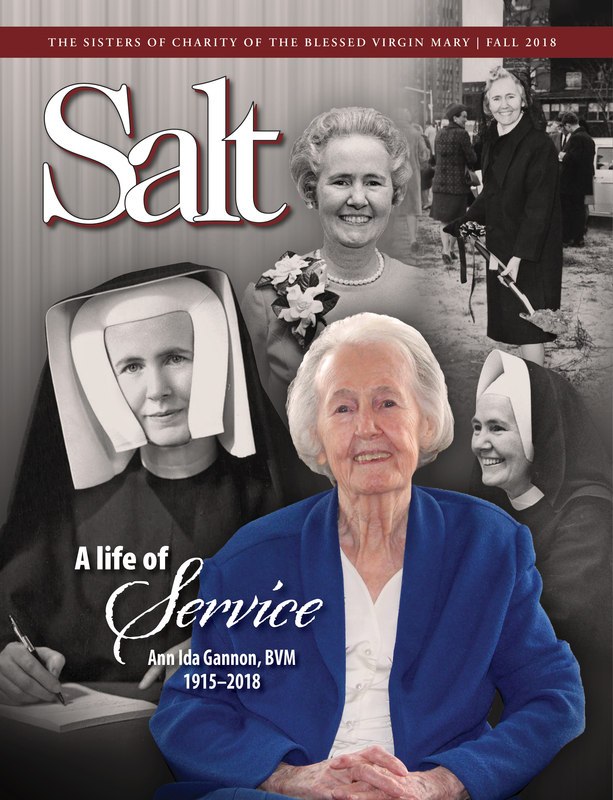 During this time, she served meals to sisters, guests, and clergy. By the late 1960s she was assisting the postmistress, Rachel Eppel, BVM. That Clarke servant of six decades, now in her mid-80s, was mentoring her young replacement, Ramona. Combined, these two women have served in the campus post office for over 90 years! The similarities between BVMs (St.) Kevin Foley and Ramona Barwick were striking. Both served Clarke entirely outside of the classroom. Both were short of stature and preferred to be in the background rather than the limelight. Deep down, both had a love for Clarke which sustained six decades of service. Indeed, except for the two-year gap between (St.) Kevin’s retirement and Ramona’s arrival, they represent 121 consecutive years of Clarke support service! 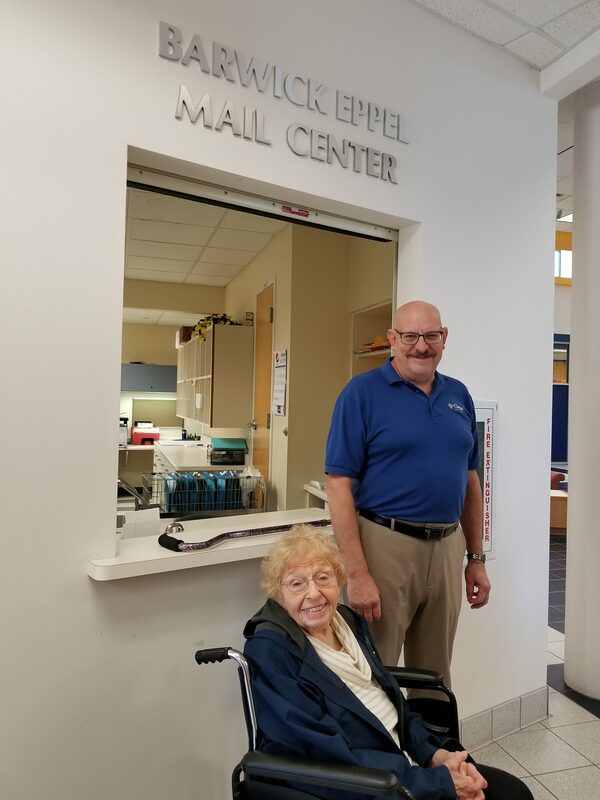 BVM Romona (Simone) Barwick “Sister Mary Bookstore” and Associate Norm Freund gather in front of the newly dedicated Barwick Eppel Mail Center named after the two BVMs who serve(ed) there for decades. While some of these great servants of Clarke labored as teachers, others did much work outside of the classroom. Two served entirely outside of the teaching profession while at Clarke. Like Rose O’Toole, BVM (one of the five BVM foundresses) before them, they spent no time in the classroom, but the entirety of their service was dedicated to improving the lives of young people through education. Teachers and administrators are essential for education, but far from sufficient. All manners of behind the scenes work are needed as well. There is food to be purchased, prepared, and served. Books to be ordered, unpacked, shelved, and sold. Mail to be sent off, received, and delivered. That service and spirit of BVM Rose O’Toole, which echoes within the Clarke halls, can be seen in all four of these Clarke servants. Over the course of 244 years, at least one of these sisters has been serving at Clarke. And, for a period of 11 years, three were serving there together! As for Ramona, the current member of the class of 61 service years: no retirement is in sight. So the legacy lives on! About the author: Associate Norm Freund is professor of philosophy at Clarke University in Dubuque, Iowa. 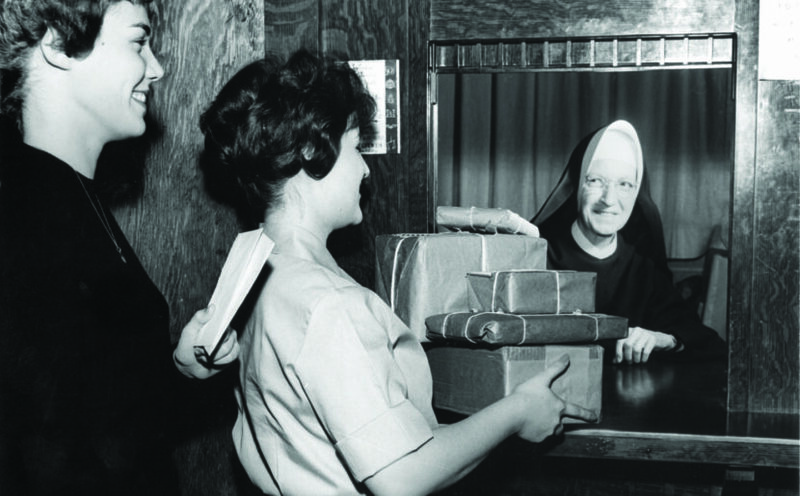 Featured photo caption: Rachel Eppel, BVM served as postmistress at Clarke University for over 30 years. In 1843, 175 years ago, a small group of women religious known today as the Sisters of Charity of Blessed Virgin Mary (BVM) traveled to the Mississippi river town of Dubuque, Iowa, at the invitation of Bishop Mathias Loras to bring education to the Iowa Territory. next post: BVM Elizabeth Galt receives Evangelli Gaudium Award for her role in the education of priests.